Considering the strong connections that remain between the two pastimes to this day, I'm sure I'm not alone among RPGers in enjoying reading about the history of miniature wargames. I've often looked over the timeline presented by The Courier and thought about how cool it would be to give some of those foundational rules a try. You can often find digital versions of old rulesets online, but I recently found that I couldn't locate the rules from War Games for Boy Scouts, a book published around 1910 and packaged with a set of toy soldiers, anywhere. I don't doubt that I'm violating some form of copyright with this, so...if you care that I've posted it and want me to take it down, please let me know (and let me know why). For the sake of scholarship and fun, this seemed like the thing to do. As for the rules, they're pretty darn short and seem to mostly govern the positioning of forces. There's no randomness in combat; stronger forces always win a battle. For someone who really wanted to amp up the old school in their OSR, though, these rules would work just fine in a campaign, and the simple presentation of combatant values (standard troops are simply worth two points, for example) would blend nicely with RPGs that use hit dice as a measure of combat strength. Fascinating stuff! I'd heard of this but never seen any detail. I'd dearly love an original copy for my collection but the likelihood is pretty remote to say the lease. Thanks for sharing. I'm glad you enjoyed it. It would be a great find for a collection. You never know...good luck! Kinda strange. 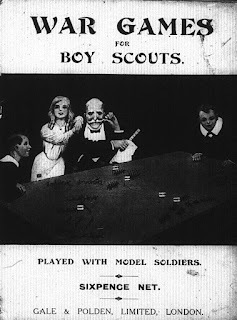 What they have to do with the Boy Scouts is a mystery to me, but they are very interesting, especially when comparing the clarity of H.G. Wells's rules with the somewhat vague nature of these. I have to admit that I've never given Wells' rules a good read (more like quick scans), so that's interesting to hear that they have a clarity not seen here. I've pretty much been chalking up these rules' lack of detail to the nature of an untested hobby (like playing Original D&D), but I'd like to look at Wells more closely for comparison now.